« Little Things Doth Crabby Make – Part XVI. Hey ls(1) And du(1) Are Supposed To Agree. Oracle Exadata Database Machine Handily Handles The Largest Database In Oracle IT. What Does That Really Mean? 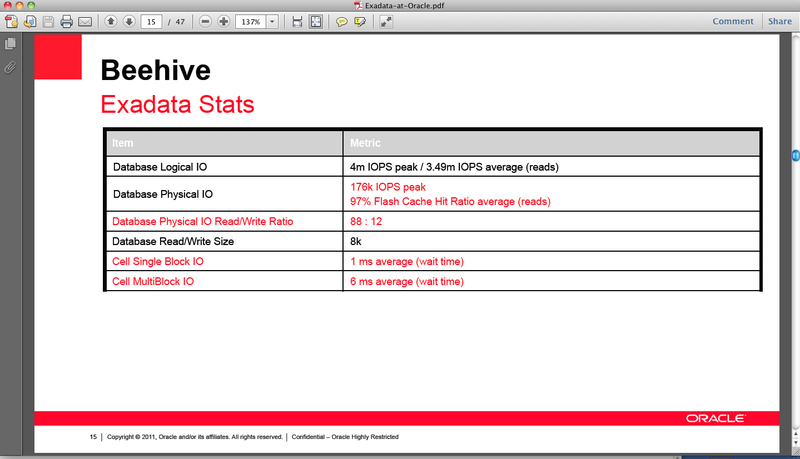 All – has anyone measured the actual IOPS from disk as well as from flash in your Exadata (production) environment and compare with what the Oracle white paper or CXO presentations claimed? Oracle’s largest in-house database is a 101-terabyte database running Beehive, the company’s in-house email and collaboration software, running on nine Oracle Exadata boxes. As it turns out, Oracle’s Campbell Webb delivered a presentation on the Beehive system at Oracle Openworld 2011. The presentation (PDF) can be found here. I’ll focus on some screenshots of that PDF to finish out this post. The techtarget.com piece quotes Campbell Webb as stating the configuration is 9 racks of Exadata gear with 24 instances of the database—but “only” 16 are currently active. That is a lot of Oracle instances and, indeed, a lot of instances can drive a great deal of physical I/O. Simply put, a 9-rack Exadata system is gargantuan. The following is a zoom-in photo of slide 12 from the presentation. It spells out that the configuration has the standard 14 Exadata Storage Servers per rack (126 / 14 == 9) and that the hosts are X2-2 models. In a standard configuration there would be 72 database hosts in a 9-rack X2-2 configuration but the techtarget.com article quotes Webb as stating 16 are active and there only 24 in total. More on that later. 4,000,000 logical I/O per second at peak utilization. That’s 250,000 db block gets + db block consistent gets (cache-buffers chain walks) per second per active host (16 hosts). That’s a good rate of SGA buffer pool cache activity—but not a crushing load for 2S Westmere EP. The physical read to write ratio is 88:12. With 126 storage servers there is roughly 47TB of Exadata Smart Flash Cache. Considering the service times for single block reads there is clear evidence that the cache management is keeping the right data in the cache. That’s a good thing. On the other hand, I see a cluster of 16 2U dual-socket Westmere-EP Real Application Clusters servers driving peak IOPS of 176,000. Someone please poke me with a stick because I’m bored to death—falling asleep. Nine racks of Exadata is capacity for 13,500,000 IOPS (read operations only of course). This database is driving 1% of that. Nine racks of Exadata should have 72 database hosts. I understand not racking them if you don’t need them, but the configuration is using less than 2 active hosts per rack—but, yes, there are 24 cabled (less than 3 per rack). Leaving out 48 X2-2 hosts is 96U—more than a full rack worth of aggregate wasted space. I don’t understand that. The servers are likely in the racks—powered off. You, the Oracle customer, can’t do that because you aren’t Oracle Product Development IT. You’ll be looking at capex—or a custom Exadata configuration if you need 16 hosts fed by 126 cells. It is not difficult to configure a Real Application Clusters system capable of beating 16 2-socket Westmere EP servers, with their 176,000 IOPS demand, with far, far less than 9 racks of hardware. It would be Oracle software just the same—just no Exadata bragging rights. And, once a modern, best-of-breed system is happily steaming along its way hustling 176,000 IOPS, you could even call it an “Engineered System.” There’d be no Exadata bragging rights though. Just a good system handling a moderate workload. There is nothing about this workload that can’t be easily handled with conventional, best-of-breed storage. EMC technology with FAST quickly comes to mind. 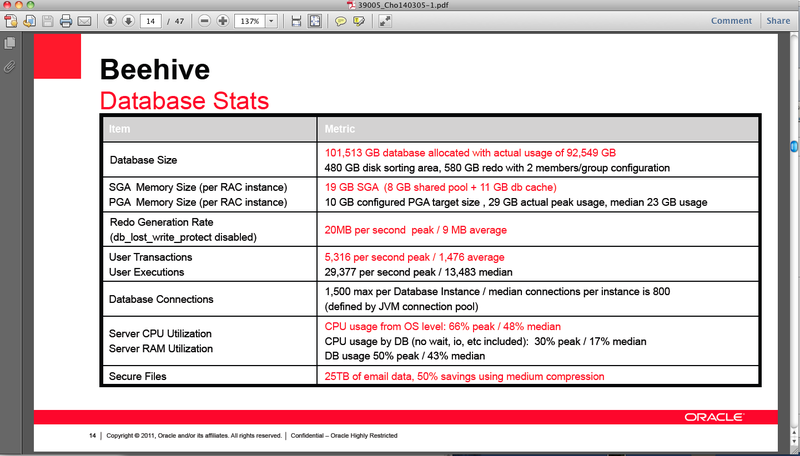 Beehive is Oracle’s largest database and it runs on a huge Exadata configuration. Those two facts put together do not make any earth-shattering proof point when you study the numbers. I don’t get it. Well, actually I do. By the way, did I mention that 176,000 IOPS is not a heavy IOPS load–especially when only 12% of them are writes? Interesting analysis. I think you have an error (or inconsistency) in the last sentence: It should be 12% *writes* per the main text? So apart from the fact that the workload profile does not match the default size and shape of Exadata, I have a major architectural beef with people taking a naturally distributed application such as email and jerry-rigging them into a complex single system image. Is it a macho thing? Or just a good way to spend marketing dollars? It certainly isn’t intelligent architectural choice. Thanks for catching the ratio flub and for your comments. Thanks for posting this. It always amazes me how the performance stats from an “amazingly” heavily accessed production database differ from what hardware vendors think of as heavily accessed. Yeah, I thought you guys would like this post. Say “Hi” to Mike for me. Using 5 small servers we can easily drive close to 1,000,000 IOPS through 1-5 TB RamSan630 serving at far less than 1 ms latency. If we configured 20 of our new RS810 – 10 TB units (mirrored for redundancy) to give 100 TB of storage we could serve in excess of 3,000,000 IOPS per mirror at less than 500 microseconds latency and 40 GB/s of sustained throughput. Needless to say, the hardware and license costs would be greatly reduced and dare I say, performance would probably be better since they can’t use all the wonderful Exadata software for a mostly small IO load.